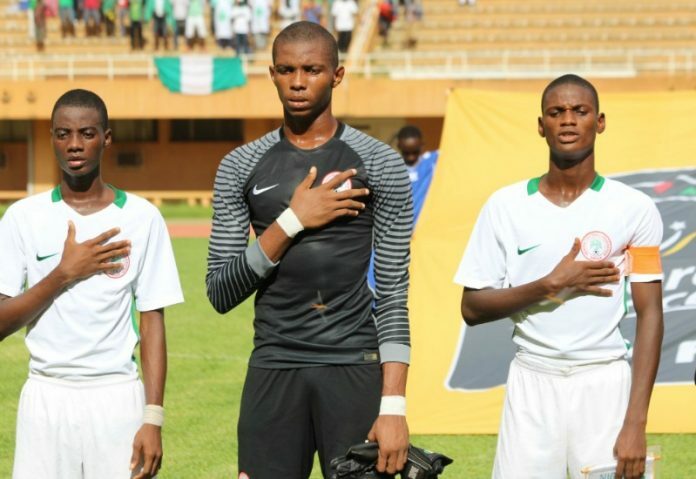 Nigeria’s cadet national team have survived a scary protest from ongoing African U17 Cup of Nations zonal qualifiers hosts, Niger Republic, who put a temporary halt to celebrations of the Golden Eaglets by alleging that their conquerors played with an ineligible player. Niger Republic tabled a formal protest after their 2-1 loss to Nigeria, alleging that one of the Eaglets, Adam Mustapha, played with an expired passport. However, the Eaglets were cleared to move ahead into Saturday’s final against Ghana, after officials of West African Football Union (WAFU) declared on Thursday that the lad in question was qualified to play. It was affirmed that Mustapha had been cleared for the competition earlier on, when he was listed for the Eaglets’ opening group game against Burkina Faso. Though he was not on the bench for Thursday night’s semi-final, the hosts put Nigeria’s celebrations on hold by quickly protesting that their conquerors used an ineligible player. The Cadet Mena formally protested after the match in Niamey that the Eaglets field a player whose international passport had expired. Niger were seeking a second straight ouster of the Nigerians, as the landlocked northern neighbours also sent the Eaglets packing on home-and-away basis from qualifying for the main continental competition of 2017. That elimination came just a year after Nigeria won a back-to-back title at the global level in Chile 2015, which took them to a record extending fifth conquest of the Cadet Mundial, having earlier emerged tops at China ’85, Japan ’93, Korea 2007 and UAE 2013. Really underhanded tactics from Niger. Can't win on the field so they rely attacking a youth player who wasn't even on the bench for an alleged expired passport? We are setting ourselves up by allowing a player with expired passport to be part of the team. happens, we may actually be disqualified. ol boi on what basis would an expired passport disqualify a player even assuming the player cleared their customs and was allowed in the country. In this case the kid wasn't even on the bench. Passport is only a travel document and its value to authenticate a person's nationality does not cease just because the passport needs renewal for traveling purposes. And neither is it a birth certificate. Last edited by jette1 on Thu Sep 13, 2018 7:22 pm, edited 1 time in total. Did you read the part that said the protest lacked any merit? How do you know the passport is actually expired? ol boi on what basis would an expired passport disqualify a player even assuming the player cleared their customs and was allowed in the country. In this case the kid wasn't even on the bench. Passport is only a travel document and its value as an authentication to a person's nationality does not cease just because the passport needs renewal for traveling purposes. And neither is it a birth certificate. Not true; only in context. Validity applies to travel use only but not necessarily to nationality authentication. I think I debunked this argument already by entering Nigeria last December with my expired passport and not only that I used same at Banks in Nigeria for transactions. Before I even boarded flight from US the same expired passport number was scanned into the airlines system not by mistake but with full knowledge that it was expired. They only needed to match the picture with my face or optics. Ones established nationality does not cease because your passport needs renewal just like your ability to drive does not cease because your license expired. Police would ticket you to renew your expired license but would not stop you from driving away in same vehicle after the ticket. Last edited by jette1 on Thu Sep 13, 2018 11:17 pm, edited 1 time in total. So Niger waited to lose before they complained,these minor African nations take these youth tournaments too seriously! Last edited by Eaglezbeak on Fri Sep 14, 2018 9:53 pm, edited 1 time in total. So Niger waited to lose before they complained,this minor African nations take these youth tournaments too seriously! ...a mere technicality. If true, the correct dispensation should be a fine. This is poor reporting. The only information we got is that a complaint was lodged by Niger and it was unsuccessful. Was there any basis to their complaint? We don't know if Nigeria did indeed have a player with an expired passport and if that was against the rules and regulations of the competition. There is also no explanation for why the player was not on the bench for the SF game. I thought every player not starting now makes the bench in such tourneys? If true, this is an unforgivable error considering how long we've been participating in these youth competitions. We should know the rules like the back of our hands by now. The person in charge of ensuring the passports are in order should be fired if it's true that one of our players had an expired passport. Let the player in question get an express passport renewal in Niger... We need him for the final..
Ok then,now understand what I'm getting at,most African nations are so hungry for success that they take it out on so called youth teams pressuring them to carry the flag where their seniors have failed! It's good all round. Kudos to Niger for their protest. It will only strengthen the administrative procedures of the NFF and at meetings, the question "what stone are we currently leaving unturned and where can we upended by our competition?" will be asked again and again and answered. Inflammatory and sensational headline to garner interest. How is a FORMAL protest scary? Was our players ever in danger of crowd lynching? Nonsense! Were any of our players in danger from crowd lynching? I hope not but yes this shouldn’t make the news. Last edited by Eaglezbeak on Fri Sep 14, 2018 9:50 pm, edited 1 time in total. Hmm, wow! I have never heard of an "expired Passport" being a reason for a team to want to disqualify an opponent. They are SOUR losers (LOOOOSERS). No wonder many have suggested they are part of the "Boko Haram" terrorist group. I was wondering about that as well. The player in question WASN'T even on the bench, so what is their complaint or protest about? On the other hand, did our player (the young man) not clear their Customs checkpoint(s)? Nigeria is involved so we must be guilty of.......something!! !